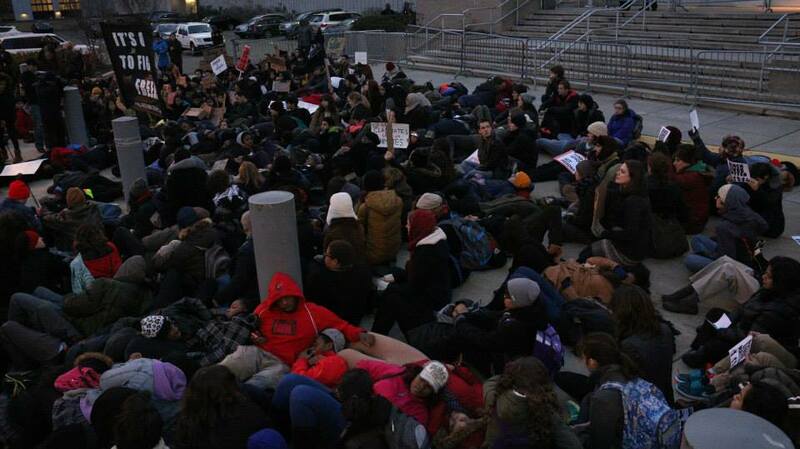 In an action organized by the Philadelphia Student Union, Boat People SOS, and Asian Americans United, students from across Philadelphia staged a die-in in front of the School District of Philadelphia. Students were also joined by teachers, parents, clergy and PFT President Jerry Jordan. After dying-in, students gave speeches and performed poetry. Their action took place before a scheduled School Reform Commission meeting. 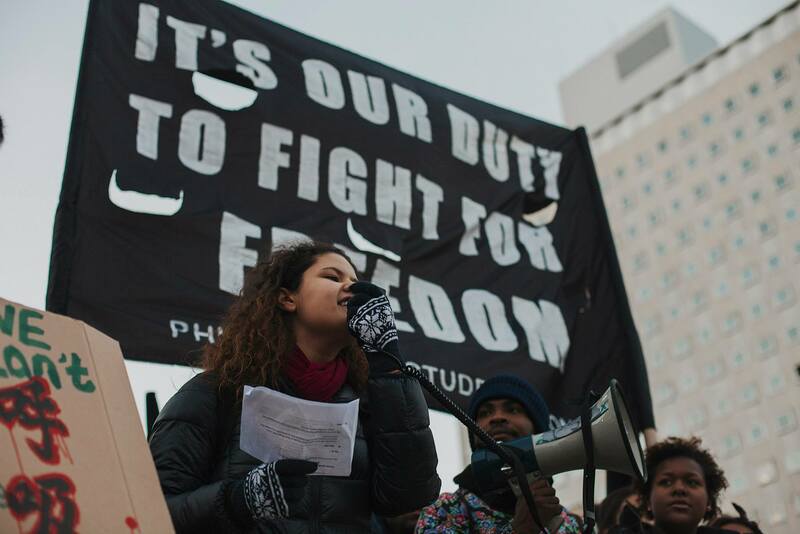 We, at the Philadelphia Student Union, define violence as “the power to hurt someone’s chances at survival.” Violence can take place interpersonally, but it can also happen in a system or institution. When Darren Wilson shot unarmed 18-year-old Mike Brown, that was violence. When our “justice” system refused to indict the killers of Mike Brown and Eric Garner, that was violence. It is violence not because it shows that the justice system does not work on behalf of Black people, but rather because it proves that this system was never designed to protect Black people. Ruby Anderson, PSU member and SLA senior addresses the crowd. Photo by Chris Fascenelli. We know that the justice system in the United States is criminally broken, serving the few and incarcerating many for minor offenses. The prison system houses millions. 25% of all people incarcerated in the world are housed in our prisons. This system does not rehabilitate, it destroys Black lives and breaks apart black families. Our education system, too, is broken and violent. The death of Laporshia Massey, a 12 year-old who died last year from an asthma attack shortly after being sent home from school because there was no nurse on duty at her school, is a shocking but real example of the ways that systematic underfunding of public education is putting students lives at risk. Laporshia’s death was a result of a state government that refused to provide adequate funding to it’s Blackest school district. Laporshia’s death was a result of the actions (and inaction) of local politicians and school district officials committed to the privatization of our schools and city, regardless of the costs on human lives. 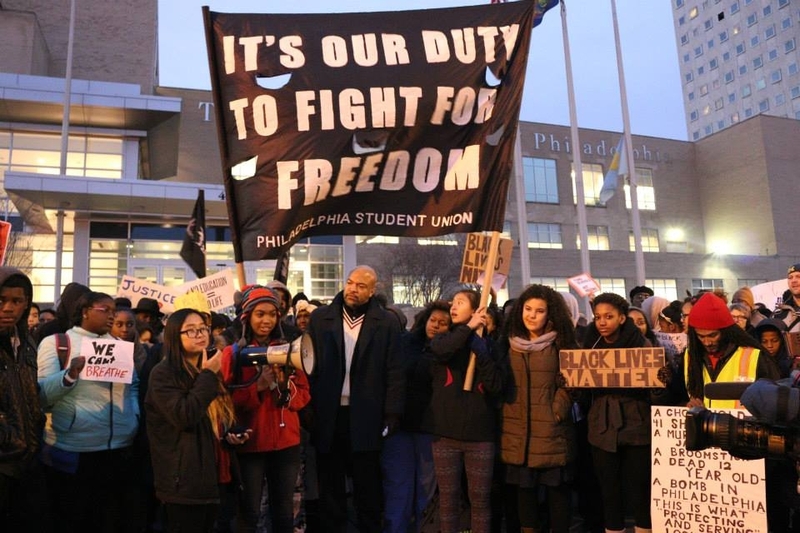 Students dying-in in front of the School District of Philadelphia. Photo by Media Mobilizing Project. When our schools are intentionally lacking nurses, counselors, books, all the things we need to be successful and safe,it is not only criminal, it’s violence. Cuts to education don’t happen in a vacuum, decisions to cut resources from school is systematic and it is disproportionately affecting, Black students. Police in our schools don’t make us safer. Police in our schools criminalize young black people everyday. We want our schools to be places of learning, not modeled after prisons. No more school closures and no new prisons. Stop all prison expansion in Philadelphia and Pennsylvania. School closures leave neighborhoods disenfranchised and prisons break families. We demand an end of systemic disinvestment of public education and a stop to the expansion of the prison industrial complex. Pennsylvania is one of only three states in the entire United States that does not have a funding formula. This would allow for poorer neighborhoods to get the resources they need, instead of punishing them. Abolish the School Reform Commission. We demand an elected school board. The SRC is nothing more than political theater to “engage the community” in a completely undemocratic process. We want to elect the people who make decisions about our schools.